You are just 57 doublings from the human hair. Within another twenty doublings, you'll see our entire galaxy, the Milky Way (#179). Then, within the next 20 doublings, we are out to the superclusters (#199) and quickly approaching the Observable Universe. Notes: This Big Board-little universe chart and the Universe Table have many blank lines and summaries. There is a lot of work to do to put everything within the correct notations. We are quickly at the limits of our own knowledge and often the knowledge of the scientific community. Take, for example, light travel. 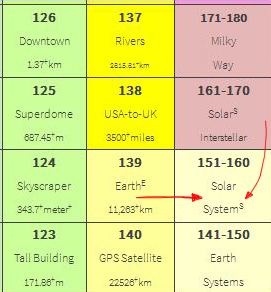 In just two more notations at 160, we reach the distance light travels in a day, then in a few more doublings, the distance in a week, and in a few more doublings, a light year and all distances are now measured in light years. Distances have become so great, even traveling at the speed of light just seems too slow to get anywhere. We've just started our journey and have a long way to go! And, yes, we'll need those Einstein-Rosen tunnels! Perhaps you have some new ideas! We hope so because that is one of the purposes of this endeavor. If you would like to learn more, there are five recent articles to explore and the most current activities are listed and linked in the right column. Notes about Look-and-feel and Navigation: Summaries and future projections of our work will continue to be being added within this section of each page. Usually if you click on the last sentence in each description you will go to the next page. 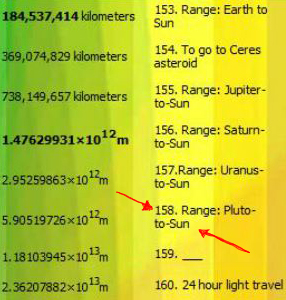 The multiple of the Planck Length at step 158 is is exactly 5.90519726×1012 meters and the distance from the Sun to Pluto is 3.67 billion miles or 5,906,376,272 km (oddly close).